Everyone knows I am a big fan of Microsoft. I always have been, even when their products were of questionable quality; what can I say, I like the company. But now, their products are masterfully designed and fully capable, a pleasure to use. Never mind they come with pricing to match, something that was once the sole domain of Apple (as were those other qualities, ahem). Even so, I am not here to extol the virtues of Microsoft’s products or even software. No, I am here to compliment their masterwork on one of their services that, sadly, is often targeted for derision: Bing. Fan I am of Microsoft, and user of Bing, the fact is it simply doesn’t provide strong results when I do a search. It will give me results that are ten years old, not relevant to what I’m asking, or just plain bizarre. I’m no fan of Google, but I will say they do search better. So you’ll understand my elation when I can finally give Bing high praise for easily blowing Google out of the water at something search related. Well not search related per se, but more their search page. This year, for Halloween 2017, Bing absolutely nails what a Halloween page should be, and destroys Google’s feeble video in the process. Score one for Bing! 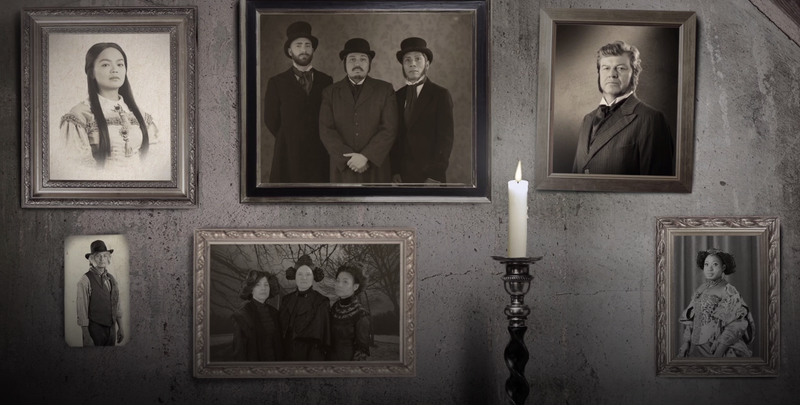 Their (almost) fully interactive homepage shows living portraits hanging on a staircase wall, and most of them have, shall we say, a unique personality when you click on them. You can view the page at any time of year by following this link, however if for whatever valid reason you have an aversion to Bing, you can also see it in the video below. Well done Bing! The fact you do Halloween right makes up for all the ineffective searches I’ve done with you over the prior year. (I tried to research how specifically this page was created but found nothing. Probably because I searched on Bing. Still, I love the page, and I’ll always be a fan, Microsoft! ).